WASHINGTON—As delighted shrieks and gasps echoed through the Capitol building, hundreds of vibrating chairs reportedly tilted and sprayed water Tuesday at a lively joint session of Congress during the nation’s first 4D State of the Union address. “So cool. The seats got bumpy and violently shook when Trump talked about how Democrats want MS-13 to flood the streets. 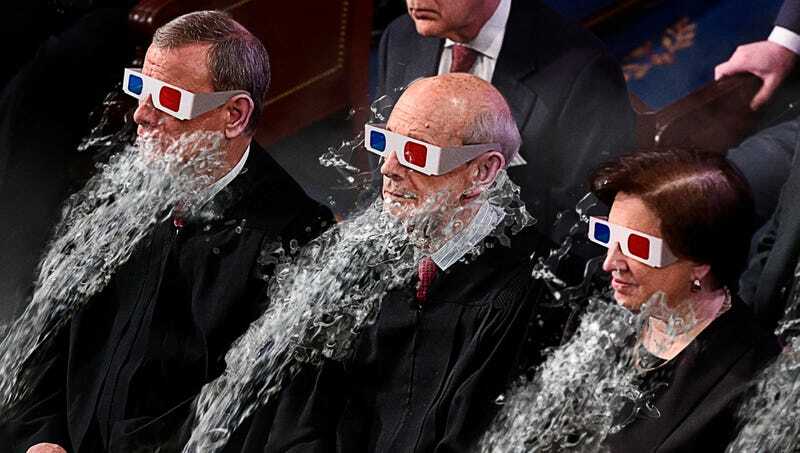 And the gunshot sound effects really made me feel like a Guatemalan illegal immigrant was shooting at me,” said 3D glasses–clad Senator Roy Blunt (R-MO), yelping as a caravan of 30-foot-tall Mexican men appeared to climb a border fence into the House Chamber. “Oh man, the part with the rainforest noises, warm mist, and tropical music totally put me in Venezuela! But the chaotic screams in Caracas really made you experience the socialist nightmare progressives want for the United States. The cool air that hits your face when Trump debunked the liberal myths of global warming was a nice touch. Same with the blast of hot air and the red fog that’s timed right as a sinister, devil-horned Nancy Pelosi pops up.” At press time, congressional historians marveled at what a major improvement the 4D address was over Dwight D. Eisenhower’s “corny” 1957 State of the Union delivered in Smell-O-Vision.